Source: Carroll, L. (1896). Symbolic Logic. New York; Macmillan & Co.
An advertisement preceding the text. The preface to the work. An explanation of important terms. An explanation of the terms involved in determining classification. The methods of division are discussed. The method by which things are named is explained. This chapter explains how definitions are created. The author explains the general characteristics of a proposition. The types of propositions of existence are explained. Propositions of relation are explained, with relevant examples provided. An explanation of the parts of the bilateral diagram, including instructions on learning the various sections. This chapter explains the designations assigned to the different counters. The author provides examples of how to represent to various types of propositions within the chart. The author suggests methods for practicing the interpretation of the diagram. The author explains the transition to using a trilateral diagram. The author describes the propositions that can be represented on the trilateral diagram. The method for representing various propositions is explained. The author explains methods for reading the trilateral diagram. This chapter details the definition and creation of syllogisms. This chapter describes the problems inherent in syllogisms. Various propositions are considered and written in subscript form. Syllogisms and subscripts come together. Definiton and introduction to sorites. The author addresses the various problems relating to soriteses. Carroll, Lewis. Symbolic Logic. Lit2Go Edition. 1896. Web. <https://etc.usf.edu/lit2go/212/symbolic-logic/>. April 19, 2019. 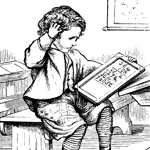 Lewis Carroll, Symbolic Logic, Li2Go edition, (1896), accessed April 19, 2019, https://etc.usf.edu/lit2go/212/symbolic-logic/.